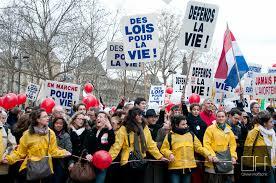 Large turn-out in Paris, France for Pro-Life annual March for Life with 40,000 participants! Hundreds of Thousands marched in the USA against abortion a few days ago with the US Vice President Mike Pence saying: "America will choose life again!" Donald Trump wants to help doctors refuse abortions. Paul Ryan also gave a speech at the largest pro-life march in the world. Currently, Poland prohibits killing of disabled children; while in France media have almost completely denied the coverage of this major event. Report indicate a large group of about 40,000 people participated, many of them young people. The spokesman for the march, Victoire de Gubernatis, is only 25 years old. Among the participants were priests, nuns and bishops, who thus expressed the support of the Catholic Church for the March pour la vie. On March 4; people are invited to participate in a Run for Life, in Paris, which is especially dedicated to those with Down Syndrome. "We are a creative minority and we preach in the desert," said Bishop Marc Aillet, who compared the life-guards with John the Baptist. The March for Life was counter protested by a dozen Femen demonstrators.